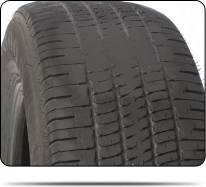 Tires should wear evenly across the entire surface of the tread. Center wear is typically due to over-inflation. 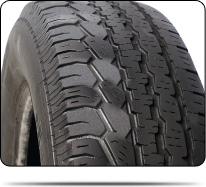 The maximum inflation pressure, listed on the tire, is for when the vehicle is fully loaded. Center wear may also be caused by mounting oversized tires onto narrow rims. 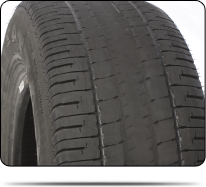 Shoulder wear is often the result of low tire pressure, overloading the vehicle, or the use of undersized tires. 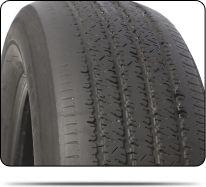 Camber wear results when the tire is not vertically aligned properly with the surface of the road. Camber wear can be caused by a weak, broken, or incorrect spring. Excessive negative camber typically results in inside edge wear. Excessive positive camber typically results in outside edge wear. Heavy shoulder wear (typically feathered tread front to rear) can be caused by hard driving. Inspect anti-sway bar end links and springs for wear. 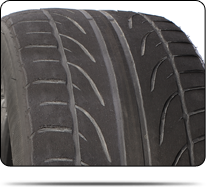 A performance tire, or one with a stiffer side wall, can reduce high speed feathering of tires. 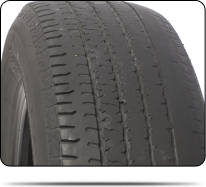 Toe wear results when the tire is not aligned parallel to the center-line of the vehicle. Basically, the tire may point "Toe In" or "Toe Out." Since toe can cause rapid wear, it is considered the most important alignment angle. Excessive toe results in a "saw toothed" pattern of wear across the tread surface. 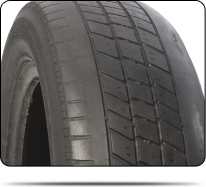 Cupped or scalloped dips appearing around the surface of the tread could indicate loose, worn, or sometimes bent suspension parts. Worn shock absorbers or unbalanced tires / wheels / brake rotors can also cause cupping, but the cupping would typically be more of a concentric pattern. When a tire slides across the road surface, it will scuff away the tread in one area. This generally happens as a result of the brakes locking up due to brake malfunction or the driver aggressively applying the brakes in an emergency situation. Flat spotting can also occur if the tire sat in oil, fuel or chemicals, or if the belts of the tire have shifted internally.